Style: Single Story "Full size split entry"
Bedrooms: 4 "3 up 1 down"
Bathrooms: 1 "Rough in for 2nd bath down"
Excellent Deal!! Full size 4 bedroom split in popular Millwood Subdivision! Located on bus route, walk to schools and playground! Private backyard bordering brook! Many updates in the last few years include, light fixtures, windows on main level, roof shingles, air exchanger, hot water heater and painting! 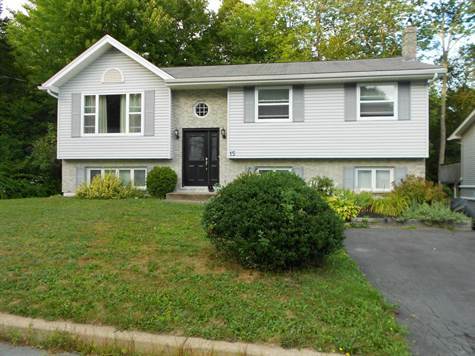 This well maintained home features 3 bedrooms upstairs, birch hardwood flooring in LR, hallway and 2 of the bedrooms, pine flooring in the 3rd bedroom. Open design kitchen and dining with eating area in kitchen as well. Downstairs has large Rec Room with woodstove and large 4th bedroom or office. There is a large laundry room with outside entrance, large storage room and rough in for large second bathroom! Nice high ceilings in the lower level and open with railing to upper level as well. Come and see this one today! Information is deemed to be correct but not guaranteed. All listings on this site are MLS and are provided by an Information Data Exchange (IDX). They may be listed by other Brokerage companies and advertised with the consent of the listing agent.